0kinawa's cherry blossom season officially started last weekend, on January 18, with the Yaedake Cherry Blossom Festival taking place along the road leading up to Mt. Yaedake in Motobu town. Read More! 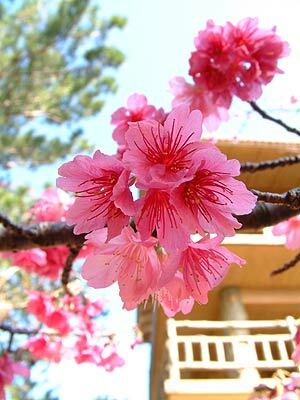 Okinawa’s cherry blossoms are in full bloom, and this weekend marks the largest “sakura festival” on the island. The 41st Nago Cherry Blossom Festival is Okinawa’s premier event, running Friday through Sunday as part of the Okinawa Flower Carnival 2003. Read More!